François Morelli’s video La mesure (2013-2014) is an ongoing project exploring the gentrification and transformation of the neighborhood of Hochelaga-Maisonneuve. 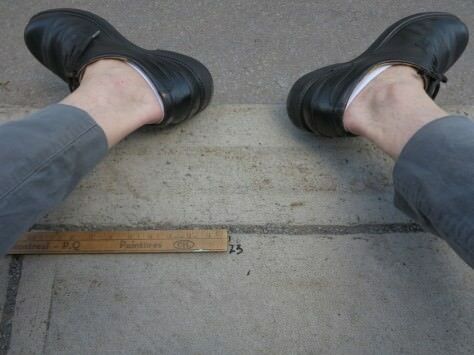 Using a yardstick, Morelli measures the length of rue Ontario in Montreal, between the corners of rue Moreau, the extreme west point, and rue Viau, moving eastwards, making marks along his path. The yardstick, a family momento, was purchased in the 1950s at Grégoire, a local hardware store in the neighborhood. The significance of rue Ontario for Morelli begins with his grandparents, having emigrated from Italy and settled in the neighborhood generations ago. As he travels down rue Ontario, he revisits his own personal history, interacting with curious passersby along the way, sharing their own personal anecdotes with him.